Coasties and Helos and Bears, Oh My! John Whiteman has an ongoing series of posts for the San Francisco Exploratorium’s on-line exhibit, Ice Stories, an NSF-funded project. The museum's staff train and equip scientists for actual in-the-field reporting. Whiteman, a PhD candidate at U Wyoming, obviously is equipped to offer technical details, and he uses plain language (and great pictures) to explain the science. Last week he reported that lack of sea ice was hampering the study, as thin ice conditions were preventing the helicopter from setting down near bears the research team had located via the radio collars with which they had outfitted the bears during spring efforts. They have since been able to land and have collected some data from the study bears. We know this from Christina Galvan's PolarTREC blog. Galvan is a teacher sailing with the polar bear team courtesy of ARCUS' PolarTREC program (also funded by NSF). In addition to reflecting on the science projects underway, Galvan faithfully answers her students' excellent questions and tells about life on the ship. 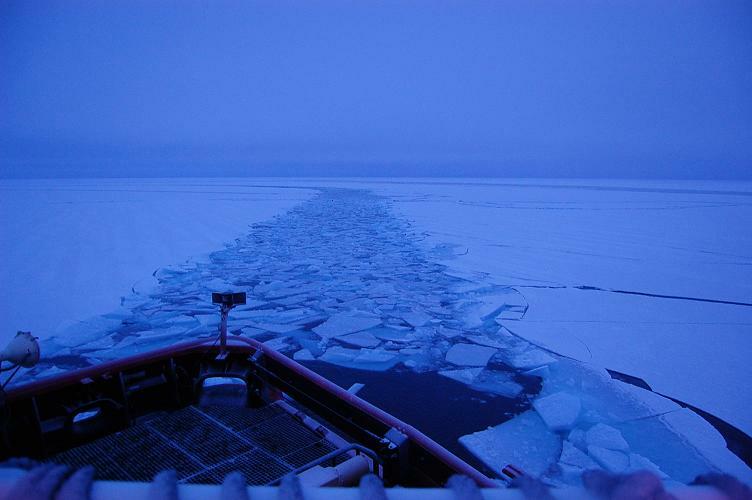 The USCGC Polar Sea's Public Affairs Officer's report. This is a weekly news posting aimed at family and friends of the Coast Guard. This is the place where we read about ship operations, for example a snarl in the steering gear that required "steering by vice-grip" for a day or so The PA also updates a photo page routinely. In addition to these sources, National Geographic and Polar Bears International also have media teams on the cruise. We'll keep an eye out for their material as well.